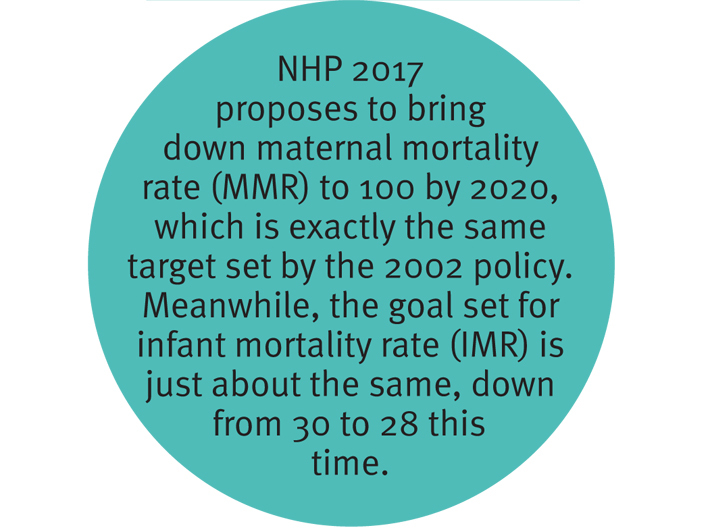 After much discussion and pondering over for more than two years, the cabinet has approved a new National Health Policy, scrapping the old one which was formulated in 2002. The government aims to increase the public health expenditure to 2.5% of the GDP by 2025. The policy formulated in 2002 aimed for reaching 2% of the GDP level by 2010. However, we hardly met our targets and the public funding on health remained around 1 to 1.15% since 2002. 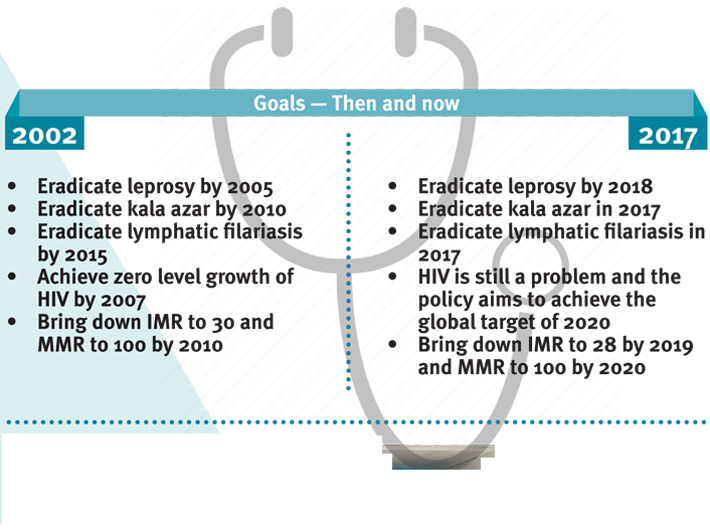 Described as the “huge milestone in the history of public health in the country” in an official press release, and “comprehensive and transformative,” by PM Narendra Modi, a comparative study with 2002 policy reveals that it has little new to offer. Barring the changes in the health statistics and target years for achieving the goals, there isn’t much in it that could transform the way public health performs in our country. Strengthening primary healthcare. But what’s new? The policy advocates allocating major proportion (up to two-thirds or more) of resources to primary care followed by secondary and tertiary. Most of the secondary healthcare services will be available for people at district level, which currently are available at big medical colleges. The government aims to bring health services to the people at their doorstep. However, a step ahead of the central government, the Aam Aadmi Party has already adopted such a model with mohalla clinics in Delhi. 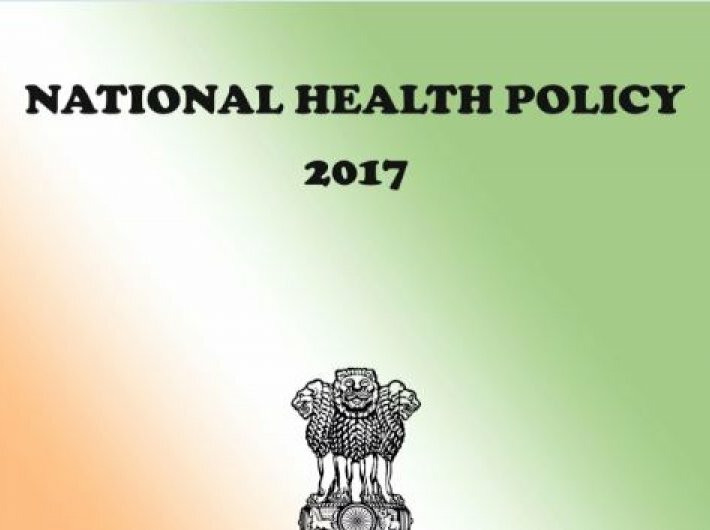 NHP 2017 proposes free drugs, free diagnostics and free emergency care services in all public hospitals and envisages strategic purchase of secondary and tertiary care services as a short-term measure to supplement and fill critical gaps in the public health system. The policy proposes better access to AYUSH remedies through co-location in public facilities. Yoga would be introduced much more widely in school and work places as part of promotion of good health as adopted in the National AYUSH Mission (NAM). It recognises the need to standardise and validate ayurvedic medicines, building research and public health skills. Linking AYUSH systems with ASHAs and VHSNCs would be an important aspect in this policy. It also talks about a mandatory bridge course that gives 15 competencies to mid-level care provider with respect to allopathic remedies. The policy recommends strengthening existing medical colleges and converting district hospitals into new medical colleges to an increase number of doctors and specialists, in states where there is shortage of doctors and paramedical staff. It also talks about the need to increase the number of post-graduate seats to meet the need of specialist doctors. The policy supports expanding the number of AIIMS like centres. National Knowledge Network shall be used for tele-education, tele-CME, tele-consultations and access to digital library. It also proposes measures for retaining doctors in rural areas.